Happy Wednesday guys!! 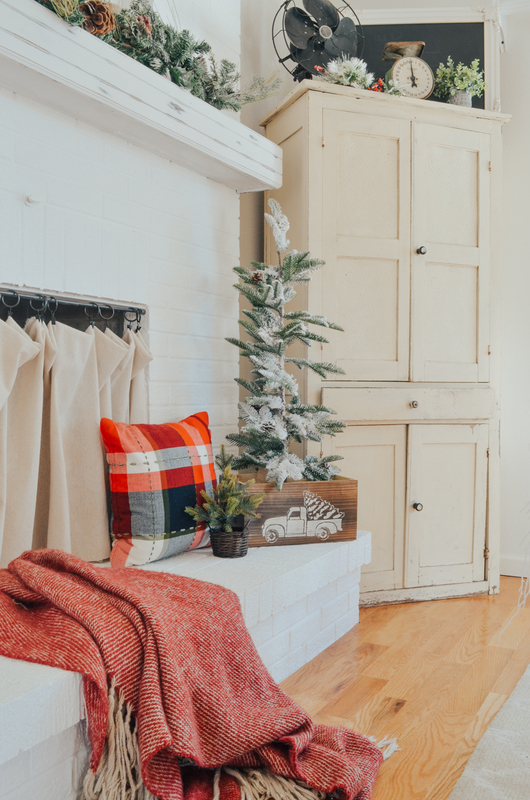 Anyone in the mood for a little Christmas DIY project? 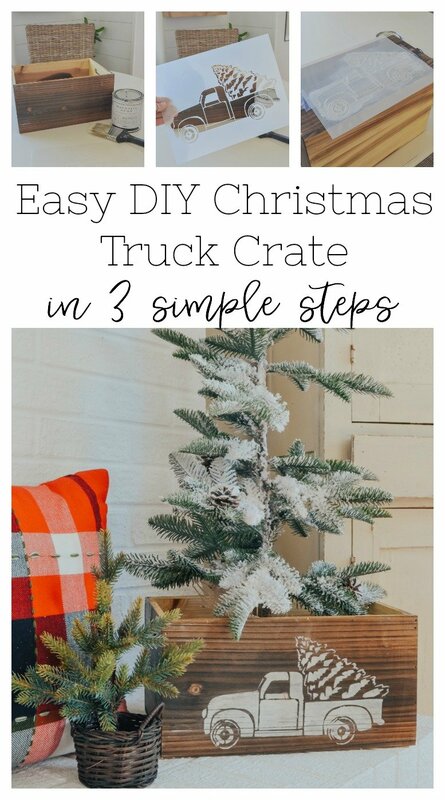 I hope so because today I’m sharing a very easy DIY Christmas truck crate. You’re probably wondering what in the heck that is and I don’t blame you. 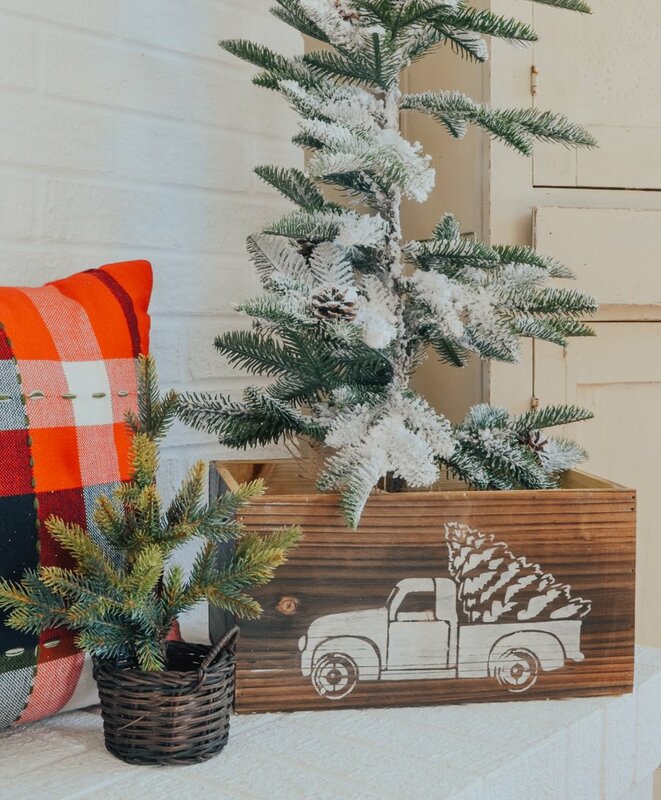 I honestly wasn’t sure what to title this post and “Christmas truck crate” is about the best thing I can come up with, so I’m rolling with it. You’ll see what I mean in a minute! Anyway, this is an insanely easy project–the whole thing took maybe fifteen minutes, but it turned out super cute and I think you guys are going to like it as much as I do. So the first step in this project was finding a small wooden crate. I picked this one up at Michael’s, but a galvanized bucket would also work really well. 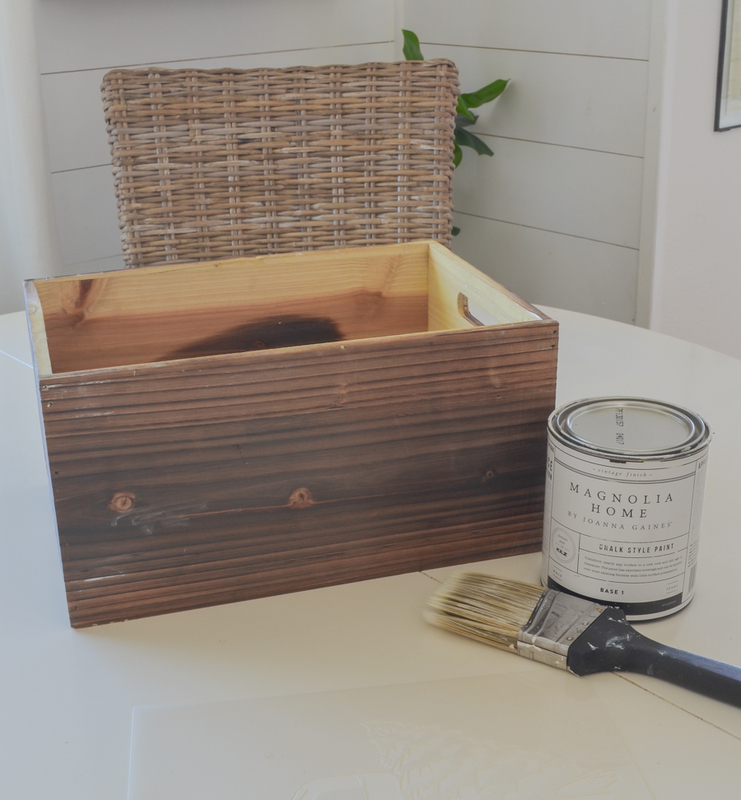 You just need something that paint can easily adhere to like wood or metal. 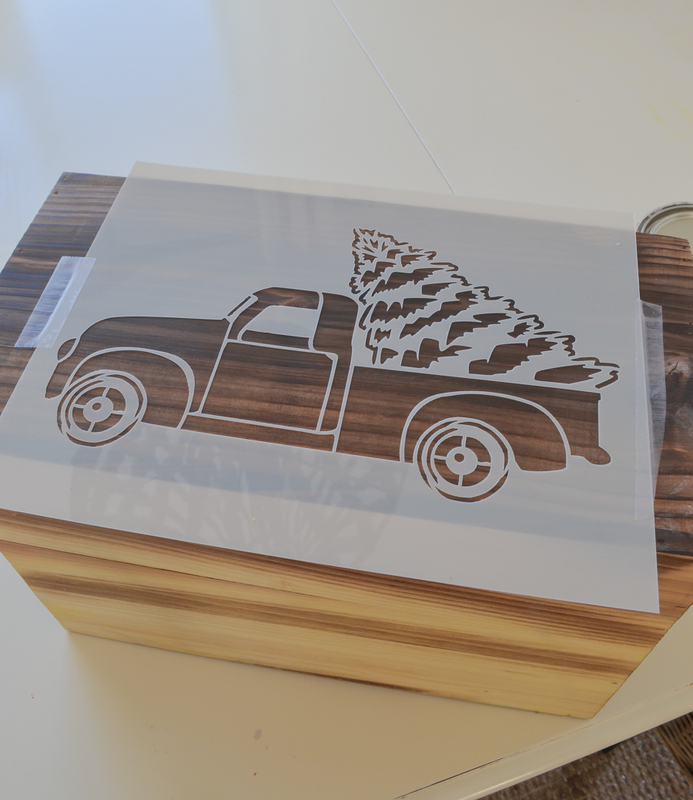 Next I took this adorable Christmas truck stencil I found on Etsy and taped it to the crate. I made sure to center it and I tried to get it as level as possible before I started painting. Next up I simply painted over the stencil with white chalk paint. You could use just about any paint you have on hand, but be careful when you’re applying the paint. Applying too much, or putting it on too thick, will cause the paint to run under the stencil and mess up the design. I applied the paint lightly with a small sponge and it worked perfectly! So adorable, right?! I love how it turned out. And if you wanted to give it a little more pizazz you could definitely paint words on the crate as well, like Christmas Trees or Tree Farm. I just went the easy route and did the truck! You guys know I love DIY projects and this one definitely falls in the easy peasy category. But that’s why I love it! Simple, quick, and very budget friendly. This stencil would also work great on a Christmas pillow, wooden sign, bucket, or anything really. 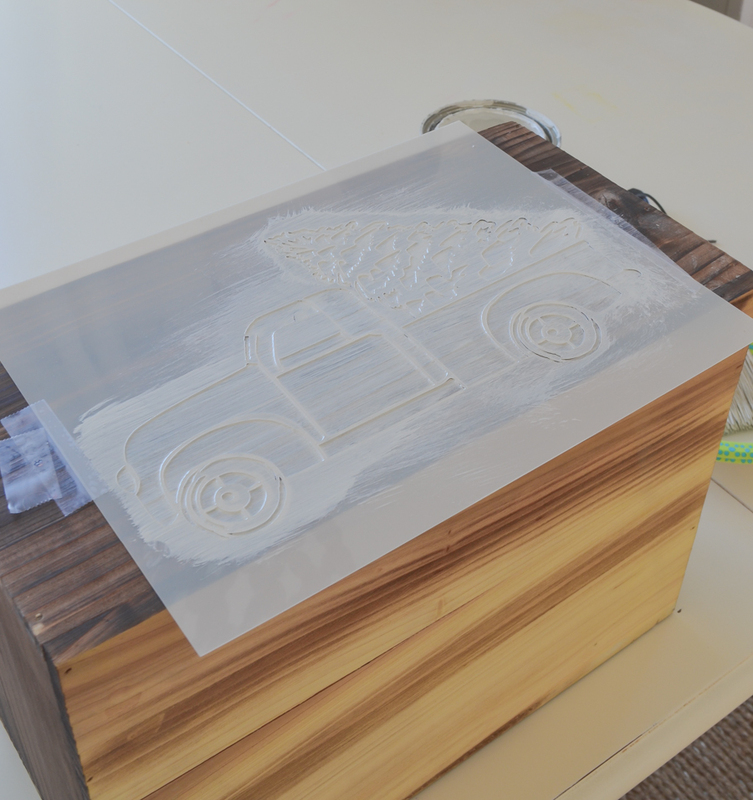 There are so many fun possibilities and you can literally use the stencil over and over again. I’m actually already planning to make another one of these crates because I love it so much. OMG…..that is adorable. Did the stencil come from Etsy? I’m going to make one or two. This is super cute! 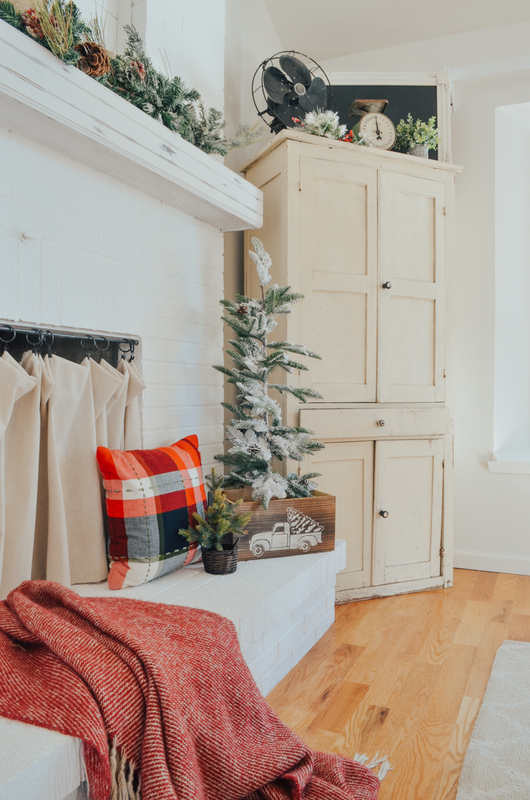 Totally affordable and easy Christmas DIY! 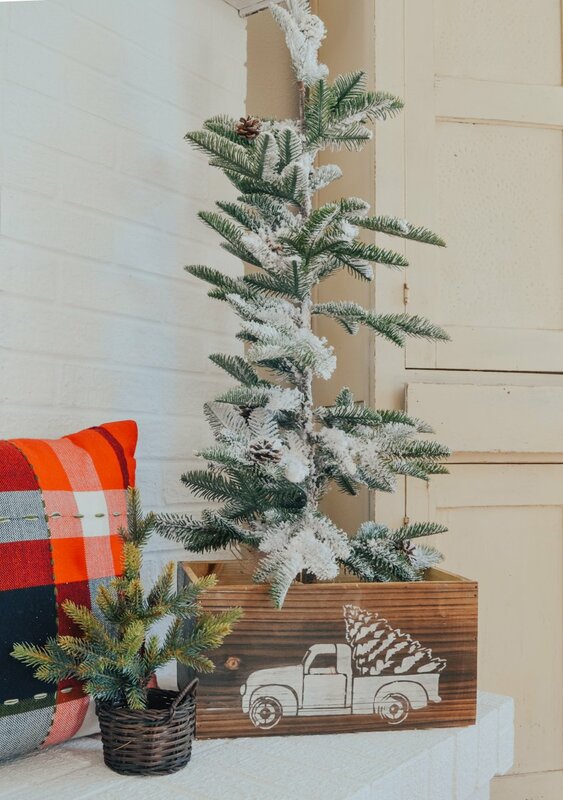 how do you have the tree standing up in the box? What did you use? you’re so full of spirit. looks good. Great diy project! So easy even I could do that! Looks great in your beautiful house. Great for gifts, you put a whole family pile of and give them the crate too! 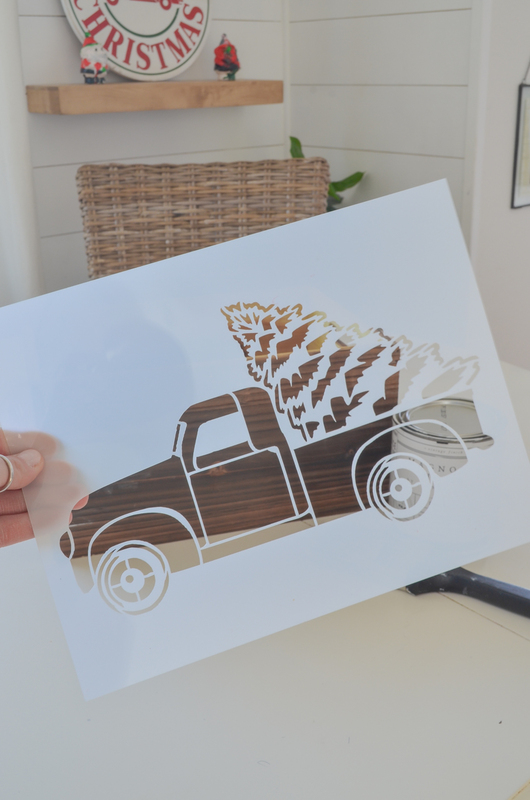 What size stencil from the Etsy link did you use? great question! Sorry I should have mentioned that. I ordered the 8.5″x 11″. How cute is that!! I would never thought of this DIY. Thanks!! Sarah, I have been following your blog for awhile and I love your ideas. Winter is my downtime so I am looking forward to starting with this easy DIY project. Thank you for sharing your awesome ideas! Oh that’s awesome Kim, enjoy your down time! That is adorable❤ Such a cute DIY prodject! Thanks Juli! I love how it turned out. 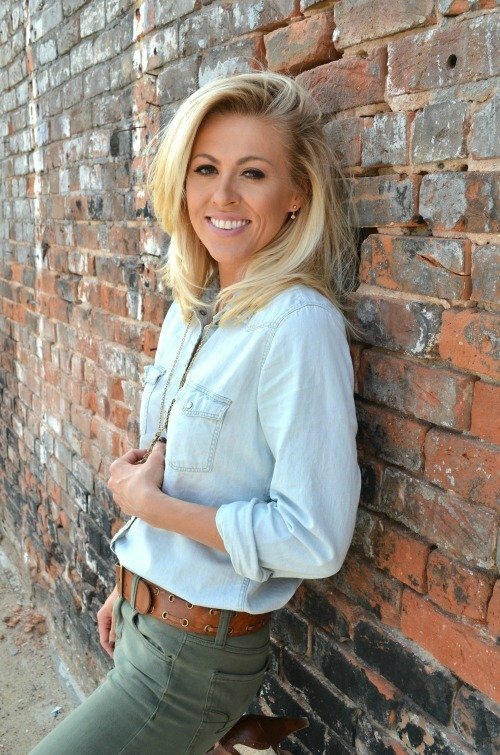 Hi Sarah, Congratulations on your featured article in Flea Market Decor magazine! Also, wanted to let you know that I love your blog. 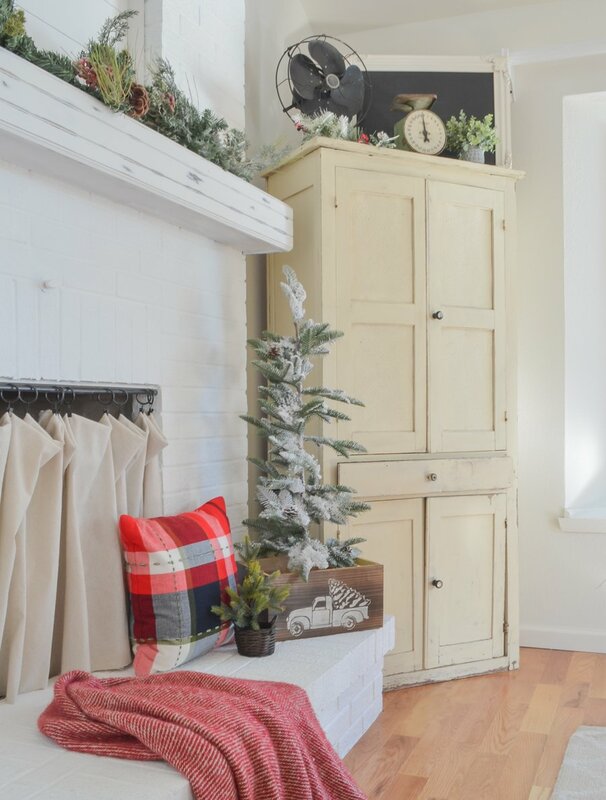 Your decorating style is very much like my own, simple, inexpensive and vintage repurposing. I look forward to your emails with new ideas! Keep up the good work! I would never have thought to use one color for that stencile, the truck looks great like that! Thanks Laura!! I thought one color would be easier haha! Oh wow 😮 super, super cute and so easy! I love this! I just love your DIY projects because they’re so realistic that anyone can do them, even the kiddies! Thanks for sharing Sarah! What a great idea! I love the way it turned out and your right, the possibilities are endless. This is such a cute little project. I bet your son would love to keep his hot wheels or books in it after Christmas in his bedroom if you are willing. haha yes!! I didn’t even think of that but what a cute idea! Seriously! So simple! This is my jam! Sarah, Went to 2 different stores looking for the Flea Market Christmas Deack the halls. All they have is January editions. Was looking forward to seeing the article of your home for Christmas.